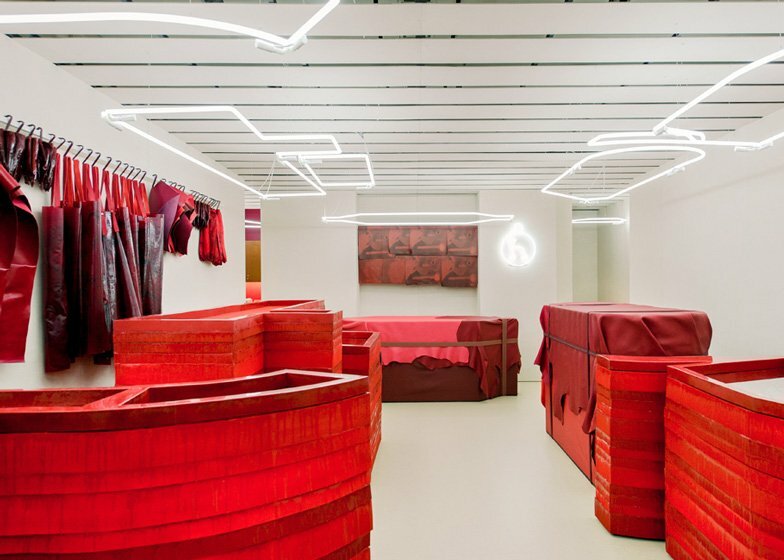 Blood appears to drip from display units and garments hang from meat hooks in this installation at the London flagship store of French fashion house Hermès by designers Studio Toogood (+ slideshow). 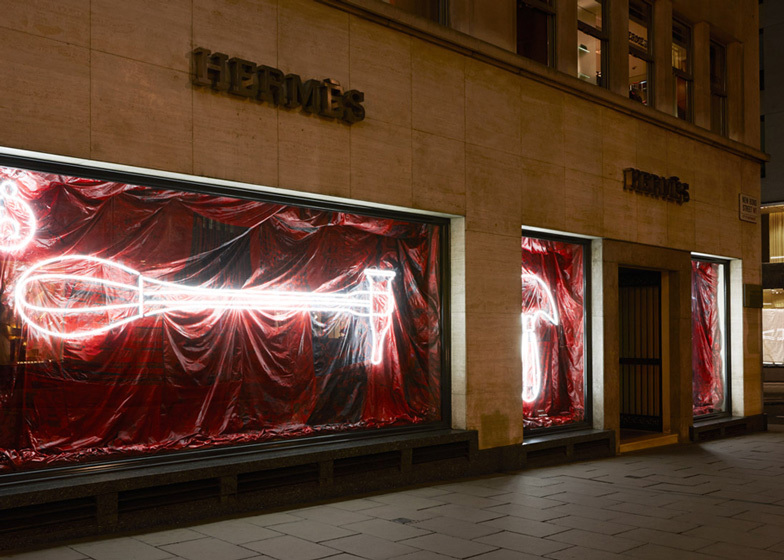 The installation was completed by designer Faye Toogood's studio for the petit h division of Hermès, taking up the ground floor of the shop on London's Bond Street. 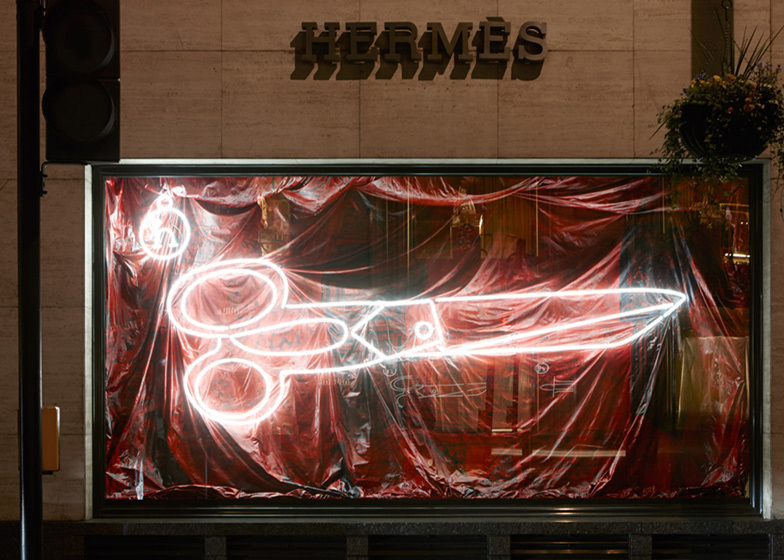 Hermès petit h was established in 2010 as a series of products using the brand's offcuts and rejected stock. 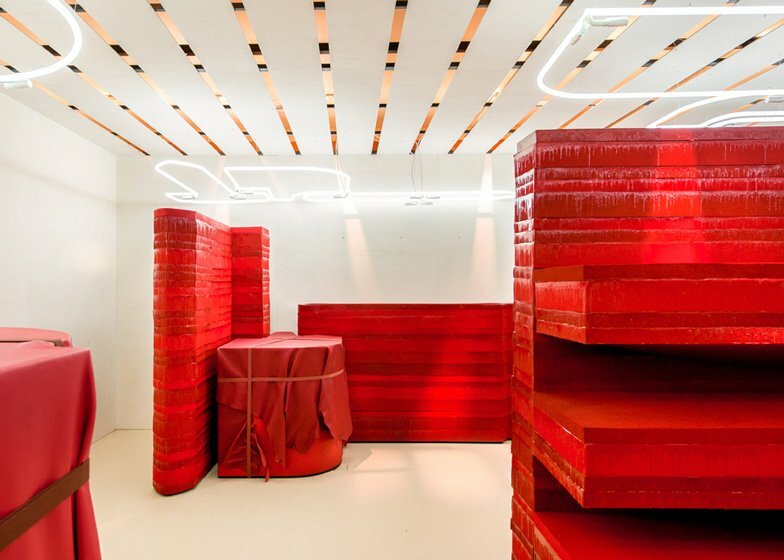 Running with this notion, Studio Toogood created red structures for the space using a blown-up template of a Hermès bag that the designers saw while visiting the brand's atelier. 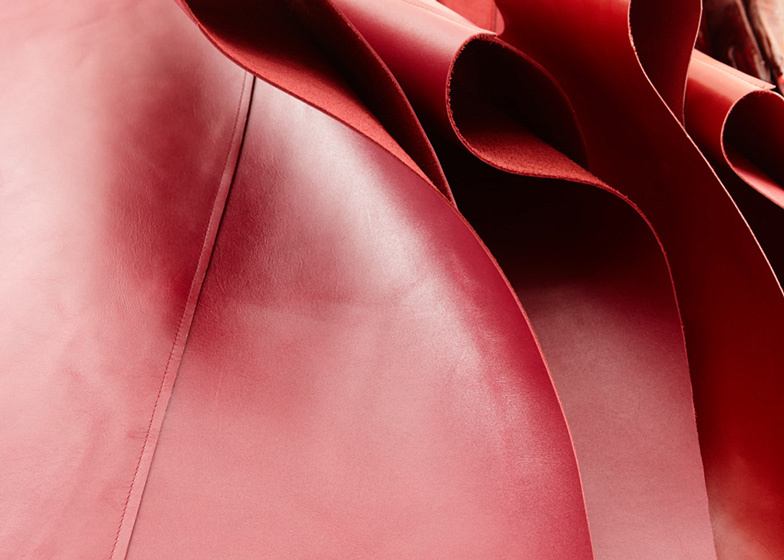 "The piece that caught my eye was a leather off-cut of a signature Hermès bag pattern," said Faye Toogood. 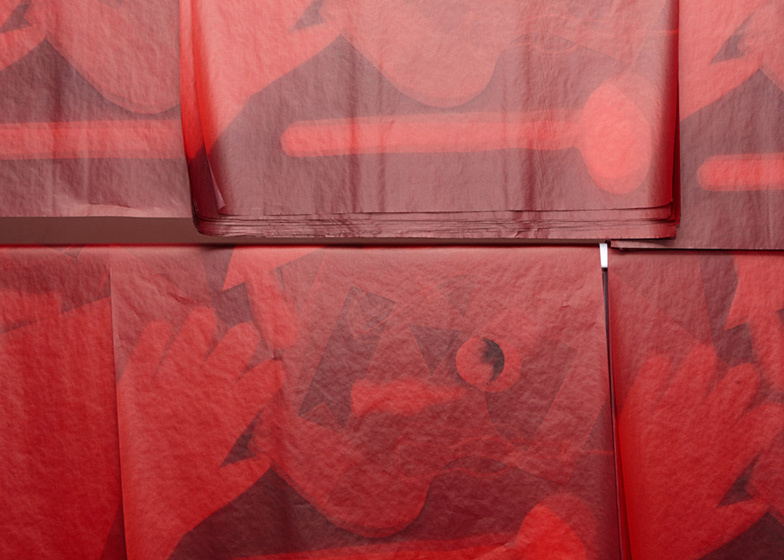 "The hide was a skeleton of the negative shapes left after the pattern cutters had cut the intricate shapes. 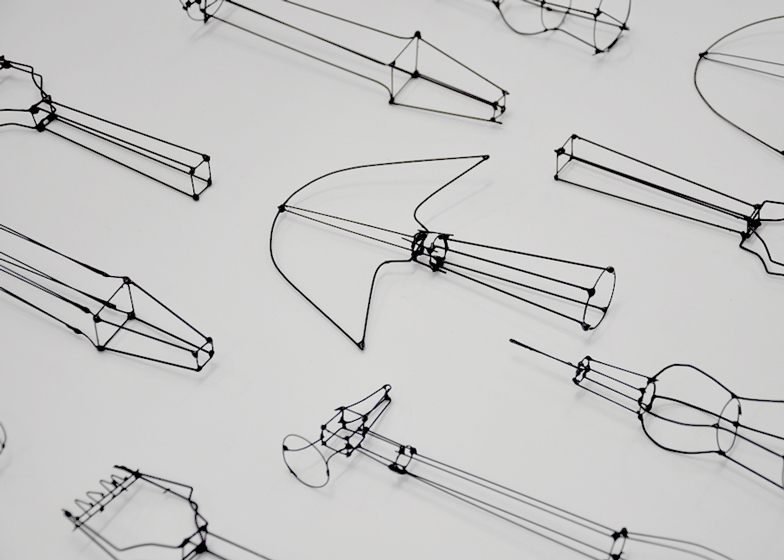 It was so inspiring to see a person working within such an established house, finding beauty in the unexpected." 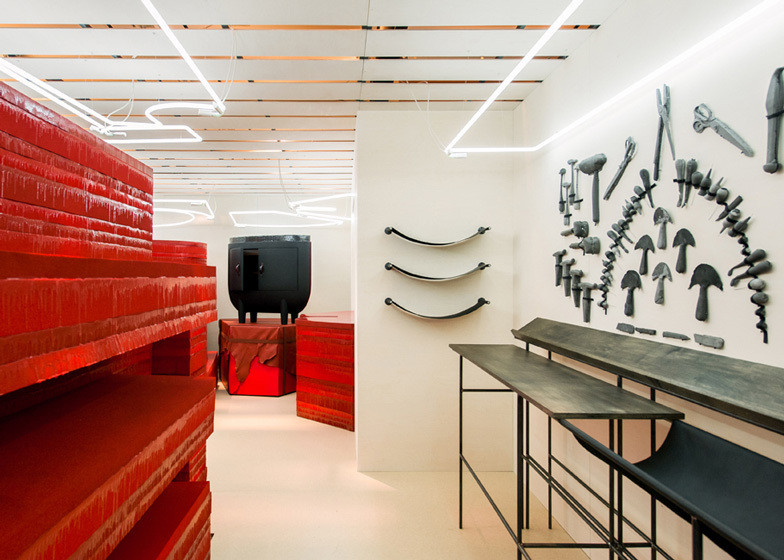 Despite looking like an abattoir, the studio insists that the ideas for the installation came from the craftsmanship that goes into creating the petit h products: "It goes without saying that this brand is truly inspiring in the way it relentlessly pushes the boundaries of craftsmanship and materials," said Toogood. 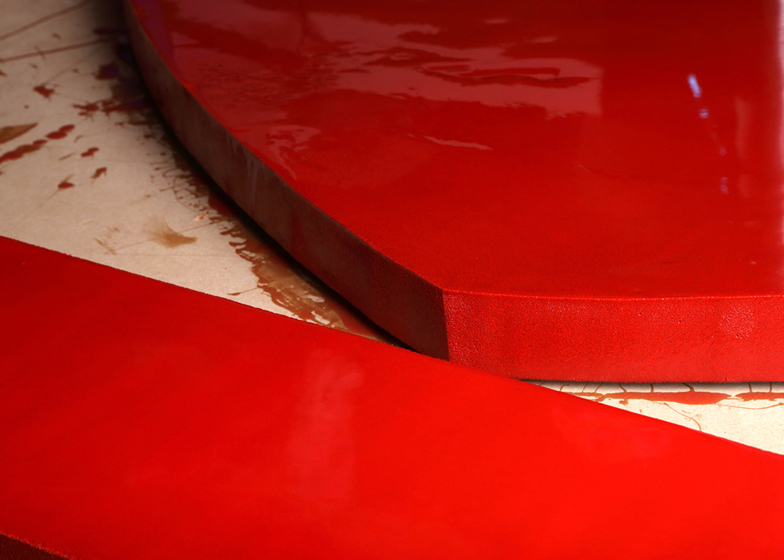 The blood red colour used throughout the store is a reference to Hermès' previous branding. 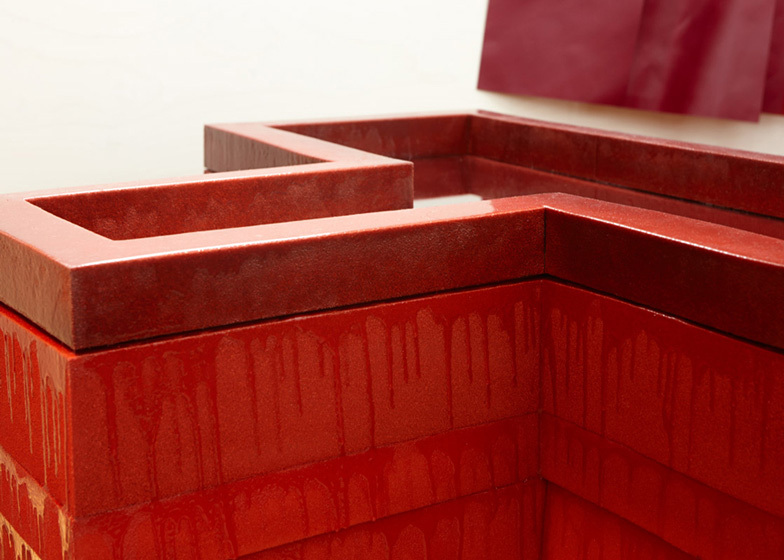 Dripping pigmented resin creates the effect of blood oozing from the display units and garments hanging from meat hooks are tinted darker red to look as though they are smeared with dried blood. 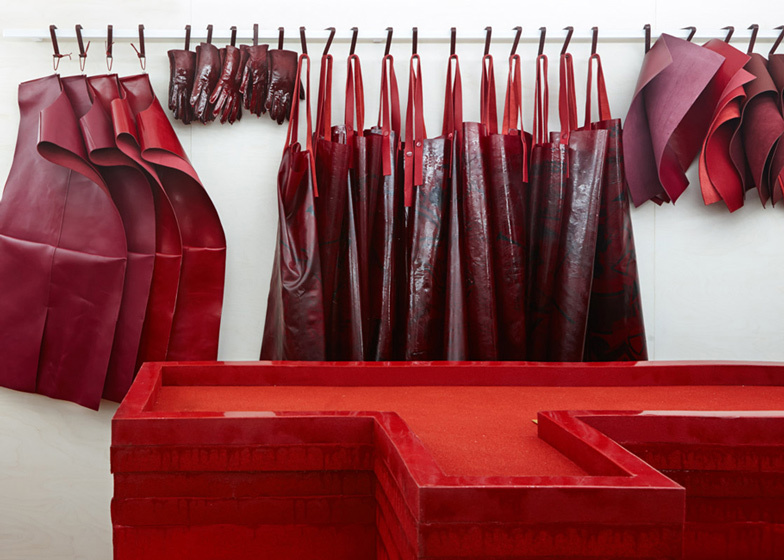 "[Items] are set against drapes assembled from offcuts and remnants of the house's iconic silk scarves, each dipped in red dye and bound together with scarlet-pigmented resin," Toogood said. 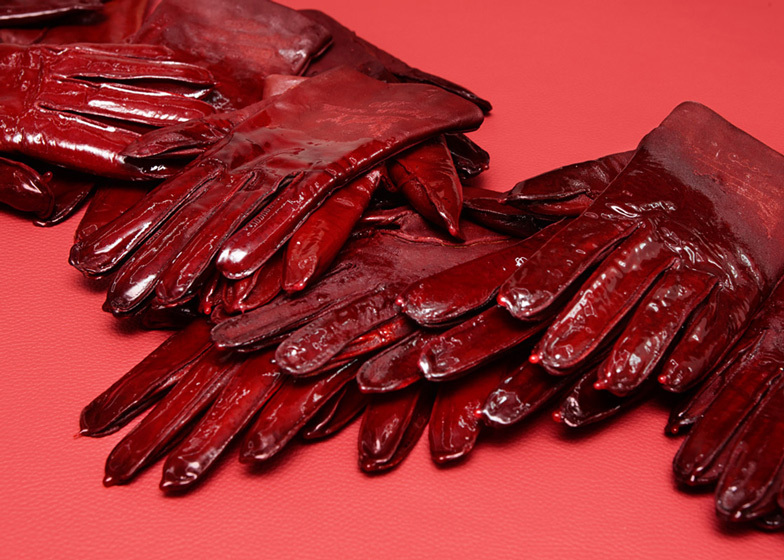 Staff wear uniforms of aprons, gloves and hats made from scrapped Hermès leather accessories and scarves, also coloured red to match the decor. Grey knives, pliers and other equipment that wouldn't look out of place in an abattoir are mounted on the wall above metal counters. 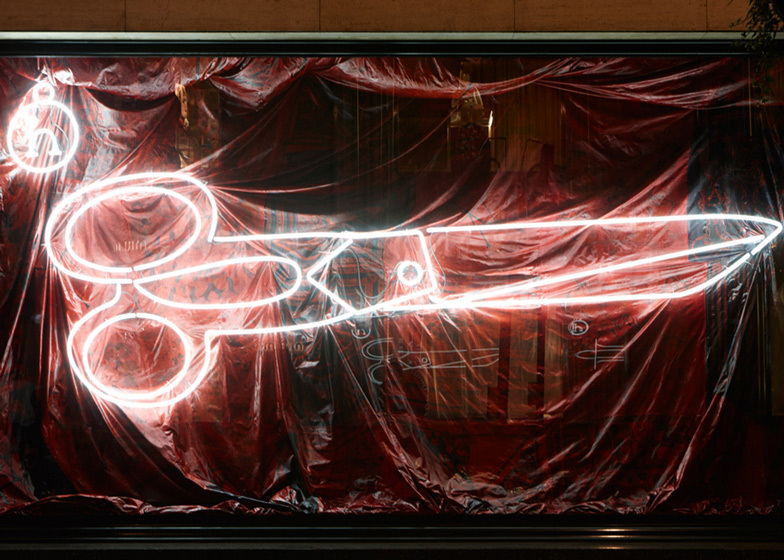 In the shop windows, neon lights depicting blown-up shapes of tools used to create the brand's products are set against red curtains. 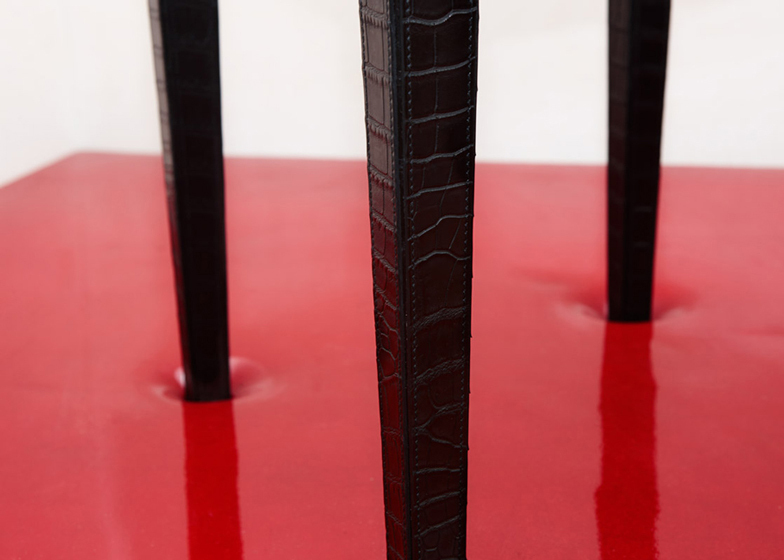 The installation will remain in place until 7 December. 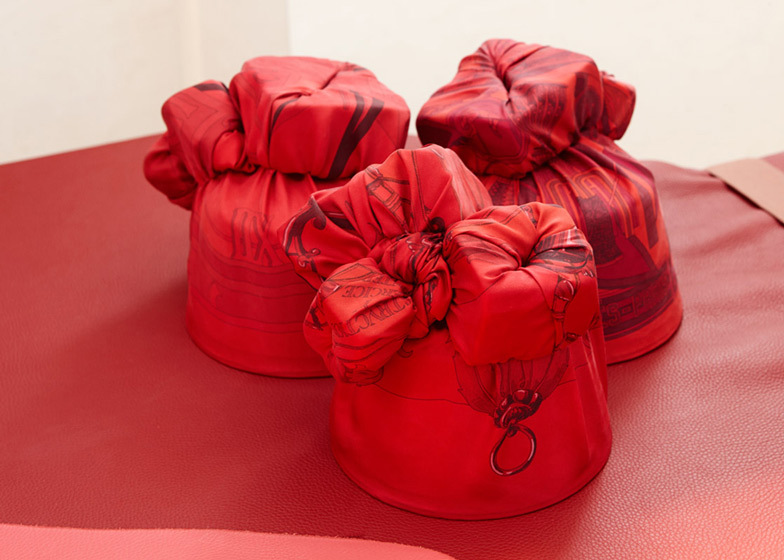 Studio Toogood has teamed up with the house of Hermès to launch petit h - a creative and poetic new take on the iconic Hermès brand that finds recreation in re-creation. 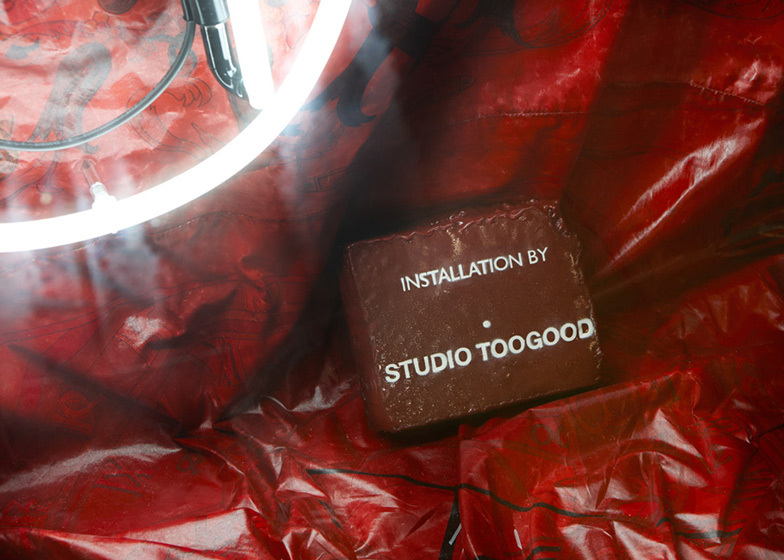 The entire ground floor of the flagship Bond Street store will be dedicated to a custom-designed Studio Toogood interior that acts as an antidote to West End slickness. 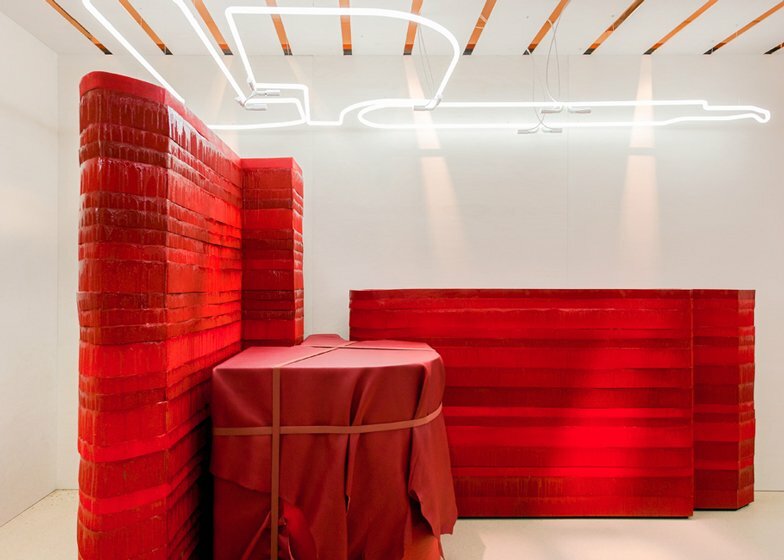 In keeping with petit h's theme of exuberant reinvention, the utilitarian white space repurposes the distinctive shapes and templates of signature Hermès bags for a series of sculptural displays in glossy leather and resin. Meanwhile, the windows are a homage to the petit h craftsmen. 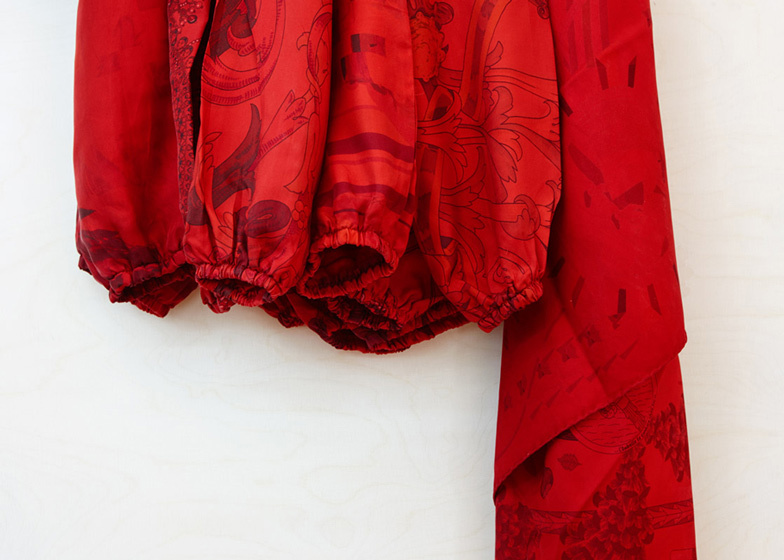 A tool from each of the trades scaled up in linear neon and set against dramatic drapes assembled from offcuts and remnants of the house's iconic silk scarves and bound together with scarlet-pigmented resin. 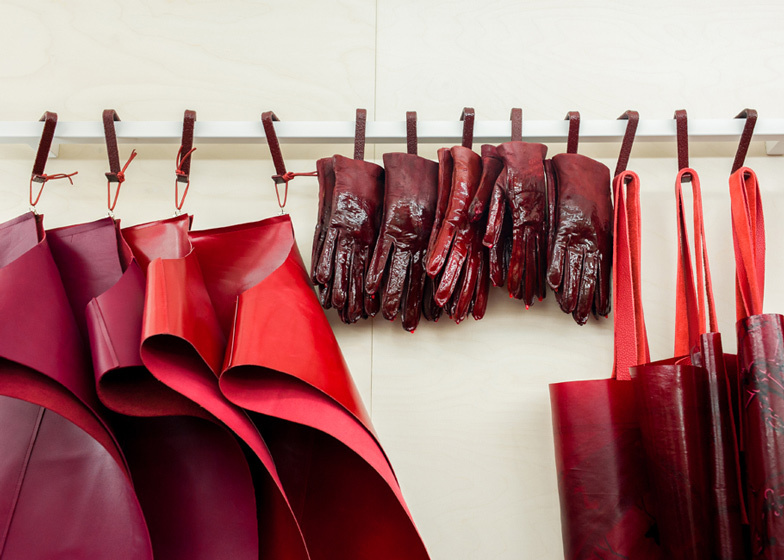 The staff too will be getting involved in the spirit of upcycling, delving into a special Studio Toogood dressing-up box filled with aprons, hats and other accessories - all fashioned from discarded Hermès scarves and leather goods.